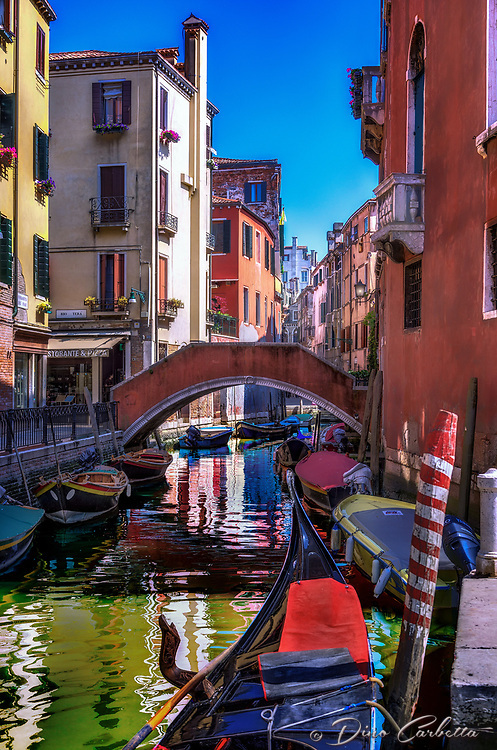 I am not sure if I am the first to describe Venice as “organic”; however, there has never been a more perfect description to define Venice’s ever changing persona. Venice is perhaps the most uniquely iconic seaside city in the world, and its impression changes by the minute with the ever changing light and active tide coming in and out. Flying into Venice via the USA, I was met with torrential rains in the early morning, which finally gave way to afternoon sunshine. The creaky, wet, gloomy, old, decaying Venice sinking and soaking in the morning rain… opened like flower petals in the springtime at first glimpse of sunlight. The organic lagoon began to blossom as if the decay became antique, the gloom became passion, the creaky became sweet sounds, and the desperate island illuminated with life, color, and hope. This image was taken along a small canal in front of The Santa Maria Gloriosa dei Frari (St. Mary of the Friars), known locally as Frari, one of the great churches of Venice. Ironically, before my Italian journey, I read Rick Steves travel book on Italy and watched all of his shows made in Italy. It seemed every American tourist had his book in their hands following closely every piece of advice he offered. As I pondered my impending images, I looked up and there was Rick about 20 feet in front of me. Sometimes one has moments of brilliance, and mine was to yell…”hey Rick” and snap a photo when he looked. He actually smiled as I walked up and shook his hand, and dumbfoundedly I shared how much he contributed to my trip. He was very gracious as we spoke for about five minutes and then he continued producing his next PBS show on the Venice Lagoon including his favorite church, Frari. As I walked away shocked by my accidental meeting, the clouds parted and the light struck a perfect note along this tiny majestic canal.